REUTERS/American-Statesman/Jay JannerTexas Gov. 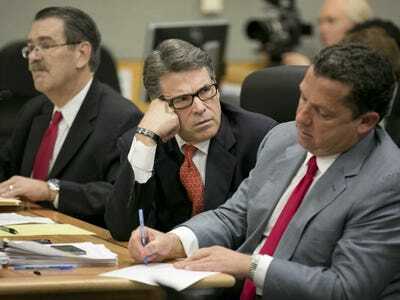 Rick Perry, center, and his lawyers David Botsford, left, and Tony Buzbee at a pretrial hearing to face abuse-of-power charges, in the 390th District Court at the Blackwell-Thurman Criminal Justice Center in Austin, Texas, on Thursday. It’s Jobs Day. The Bureau of Labour Statistics will release October jobs stats at 8:30 a.m. ET. Economists estimate US companies added 235,000 payrolls as the unemployment rate held steady at 5.9%. Markets Are Going Nowhere. Ahead of the report, markets aren’t doing much. Dow futures are up 1 point, and S&P futures are down 1 point. Most major European markets are down by less than 1%. Japan’s Nikkei closed up 0.5%, and Hong Kong’s Hang Seng closed down 0.4%. Keep in mind that the S&P 500 closed on Thursday at an all-time high. German Industrial Data Was Weaker Than Expected. Analysts thought production would bounce back 2% after a 3.1% drop last month, but output increased by only 1.4% in September. Bank Of America Lost Money Last Quarter. Bank of America has revised down its third-quarter earnings by $US400 million amid a currency probe that has forced it to add to its legal reserves. Auto Parts Maker Takata Got Slammed By A New York Times Article. Shares in Takata fell more than 8% on Friday after The New York Times reported that the Japanese auto parts maker had concealed the risks of potentially defective air bags. The Cleveland Fed President Says Rates Are Going Up. The Federal Reserve will most likely raise interest rates next year because inflation, while a bit low now, remains stable and should rise to target by the end of 2016, Loretta Mester said.